I've been working on this post for months. While I did get some basic, fluff answers like "spiders," "thunderstorms," "Honey Boo-Boo," etc. I did get a lot of really, really powerful responses. I promised to keep the responses anonymous. But I will admit, one of the following fears belongs to me. I always think it's interesting, empowering, and comforting to know that I'm not alone in something. 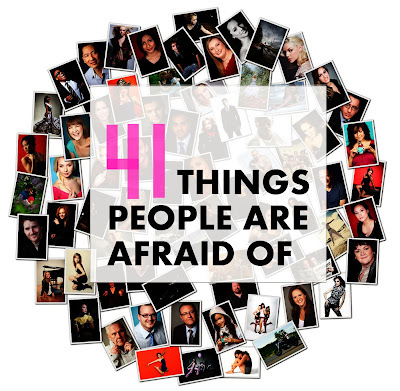 So I hope you see at least one fear listed below that you can relate to. It means that someone else is afraid of the same thing. And it means that it's OK to be afraid, as long as you don't allow your fears to prevent you from living your dreams. "There is only one thing that makes a dream impossible to achieve: the fear of failure." 1. I'm afraid I'll never find the right guy. 2. I'm afraid that I'll eventually have to start dating outside of my race...and that my parents won't be OK with it. 3. I'm afraid that I'll lose my scholarship after this semester. 4. I'm afraid that the people I call my friends may actually be my enemies. 5. I'm afraid that I will let my family down. 6. I'm afraid my family may lose our home because my parents are paying my way through school. 7. I'm afraid people will find out my real religious beliefs. 8. I'm afraid that I will never find a job that I love. 9. I'm afraid my boyfriend may not be the one. 10. I'm afraid of getting stuck in a job I hate. 11. I'm afraid that one day I'll leave my flat iron on and I will accidentally burn my entire complex down. 12. I'm afraid of never being good enough. 13. I'm afraid of settling and not knowing I'm settling. 14. I'm afraid to have a child in this crazy world we live in. 15. I'm afraid that if I don't have the latest and trendiest fashion, I won't fit in. 16. I'm afraid to skip my sorority events. 17. I'm afraid that my child will be bullied at school or online. 18. I'm afraid that I will fail two classes this semester. 19. I'm afraid that someone will steal my idea before I can make it a reality. 20. I'm afraid of saying no. 21. I'm afraid of ending up homeless in a world that ignores homeless people. 22. I'm afraid of admitting my real past because I know I'll be judged. 23. I'm afraid of eating sushi. 24. I'm afraid of having my identity stolen for financial purposes or because someone uses my photos to "Catfish" someone else. 25. I'm afraid that I will have to turn to online dating to find my mate. 26. I'm afraid that I'm only good at being bad. 27. I'm afraid that someone I love or I will get cancer. 28. I'm afraid that Miley Cyrus is a role model for our children. 29. I'm afraid I will become addicted to drugs like my dad. 30. I'm afraid I'll never be as successful as possible...because I'm a woman. 31. I'm afraid my blog will be a complete failure, and I will be too. 32. I'm afraid my long distance relationship won't last. 33. I'm afraid I won't get into the college I want. 34. I'm afraid to go a day without checking my phone, social media, emails, etc. 35. I'm afraid for people to read what I write. 36. I'm afraid that racism is only getting worse. 37. I'm afraid that I'll never finish paying off my student loans. 38. I'm afraid my wedding won't be as good as my Pinterest board. 39. I'm afraid that I'm wasting my life. 40. I'm afraid that I'll never be satisfied with life. 41. I'm afraid that I'll never find myself. If you're feeling brave, leave a comment with your fear or with the number(s) that match your fear. 20 and 40 definitely, this is a great post, thanks for sharing, xoxo. I think I identify with pretty much ALL of yours to be honest.... geez didn't know I was so AFRAID! These are very interesting. I definitely think having a family member get sick or die is a fear that everyone shares. Wow so interesting to read the fears of total strangers. I definitely have a fear of starting a family based on how scary the world has become. I'm afraid that I'm now a failure and that going to law school was a real expensive mistake that means I'll never be able to provide the same level of support for my children that my parents were able to give me and my sisters. I worry that they'll need surgery or braces and my husband and I won't be able to afford it. Or that we'll never even have enough money to move out of our tiny apartment and have children. So I can totally relate to no. 37 and no. 21. I can also relate to no. 7 but its not one that I would have thought of right away. This is great! It's nice to know that you're not alone in the way you're feeling, I know this made me feel somewhat better about my fears. Not enough to embrace them because who embraces fears? Lol but enough to try my best to get past them. So agree with lots of these... It would be so hard for me to pick just one fear! #2: I luckily never had much fear in this area. My oldest full-brother had almost always dated black women for years, long before I dated Daisy. My mom had her issues at first (though to be fair his first real girlfriend was CRAZY), but she's had a really good relationship with her daughter-in-law. And they gave my mom her first grand-daughter and now my niece really knows and loves her grandma Donna and it's hard to separate them both. So dating (and now engaged) a Asian woman wasn't that big of a deal to them. Her family hasn't caused much issues either. Her aunt's 2nd husband is Italian-American, and at least half of her female-cousins usually have Caucasian boyfriends/husbands if they're not single. I'm so afraid of saying no to anyone. I agree with many of these, I think they apply to so many women today. Wonderful post. Yes, it does help to know one is not alone with one's fears, that one is really quite normal and that EVERYONE has their challenges and crosses to bear. "Do it afraid" is a motto I'm learning to embrace more and more -- indeed, it really is the only way to conquer fear I think. Well, I'm certainly more than a little concerned that Miley Cyrus is a role model for our children (wanted in fact to post about that haha). awesome post dear,28 is hilaraous. This post coves all my fears..
i can relate to a few! I love the honesty of the responses you got! I can definitely relate to a bunch of them. And the flat iron one has happened to me before...I had a panic attack that I left it on and had my neighbor go into my apartment to check! I am afraid that I can relate to some of them! i can related to the majority of these responses. There are so many things in this post that are fears I have that I didn't realize until now! talk about crazy! WHOA! This is a genius idea for a post and I am so glad you did this! This is so eye opening it's unbelievable! I love this! Sharing this with everyone!